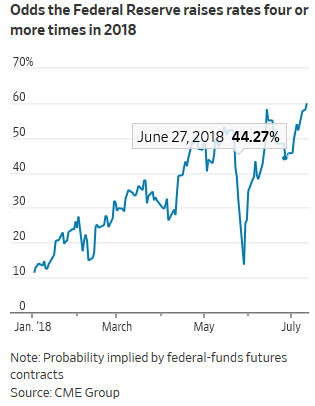 Investors are bracing for a period of consistently higher inflation, raising bets that the Federal Reserve will deliver a fourth interest-rate increase this year as an intensifying trade spat between the U.S. and China threatens to add to mounting price pressures.Federal-funds futures, which investors use to bet on central bank policy, on Thursday showed a roughly 60% chance that the Fed will raise rates at least four times this year, according to CME Group data. That marks one of the highest levels this year and compares to a 35% probability at the start of June. Increasing confidence in the Fed’s plans for tightening policy come as measures of price growth for both U.S. consumers and businesses rise at their fastest pace in years. A Labor Department report Thursday showed the consumer price index rose 2.9% from a year earlier in June, the strongest growth since February 2012, and 2.3% when excluding volatile categories like energy and food. A separate gauge of U.S. business prices rose at the strongest pace since 2011. Mounting expectations are already rippling through global markets. The U.S. dollar surged 0.8% against a basket of major peers on Wednesday, reviving pressure on the currencies, stocks and bonds of emerging markets. U.S. stocks also fell as investors responded to White House plans announced Tuesday to impose tariffs on another $200 billion in Chinese goods. The S&P 500 rebounded 0.3% in morning trading Thursday. Economists believe the latest round of tariff threats—which come less than a week after the U.S. and China imposed tariffs on $34 billion in each others’ goods—will drive up costs for U.S. goods at a time when inflation is already accelerating. Signs of rising inflation have prompted volatility in stocks and bonds this year, including in February, when the Dow Jones Industrial Average posted its largest daily point decline on record. The recent firming in inflation comes after a long period of tepid growth that had confounded investors and policy makers, who expected the strengthening economy and labor market to bolster prices. The Fed is tasked with keeping inflation stable, and some investors believe a “price shock” sparked by tariffs could lead the central bank to ramp up policy-tightening after following a slow-and-steady approach since 2015. Pantheon Macroeconomics estimates the tariffs could drive up core consumer prices, which excludes volatile categories like food and energy, by 0.6% from a current level just above 2%. “The Fed can’t stand back and ignore a hit of this size, given the tightness of the labor market,” said Ian Shepherdson, the firm’s chief economist. 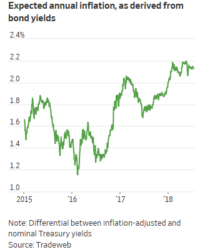 Even some of the Fed’s more cautious officials are coming around to a more aggressive policy stance as the inflation rebound appears here to stay. Chicago Fed President Charles Evans said in an interview this week that he thinks the economy can handle higher rates and expressed optimism about the inflation rebound. “We’ll see about the sustainability, but it looks quite good,” he said. A pickup in inflation and a faster pace of rate-increases would have far-reaching implications for global markets. Tighter Fed policy could amplify the recent surge in the dollar, which has battered the currencies of emerging markets like Argentina and Turkey that borrowed heavily in the U.S. currency. In the bond market, investors have been buying up bonds that protect them from higher inflation. Inflation-adjusted Treasurys, whose value increases along with measures of consumer prices, have returned 0.2% this year, compared with a 1.1% loss for nominal Treasurys, according to Bloomberg Barclays bond indexes. A measure of bond-market expectations for the pace of annual inflation over the next decade, as measured by the differential between inflation-adjusted and nominal Treasurys, has been above 2% every day this year. On Thursday, the 10-year breakeven rate was at 2.13%, Tradeweb data show. Investors say U.S. stocks could come under pressure as companies face higher costs for materials used to make goods, supply chain disruptions and higher borrowing costs. Consumer-staples companies such as sellers of food and household products have already been hit by rising costs. The S&P 500 consumer-staples sector is down about 8% this year, placing it among the worst performers in the broader index, which is up more than 4%. PepsiCo Inc., which is in that grouping, flagged rising costs in an earnings call this week. 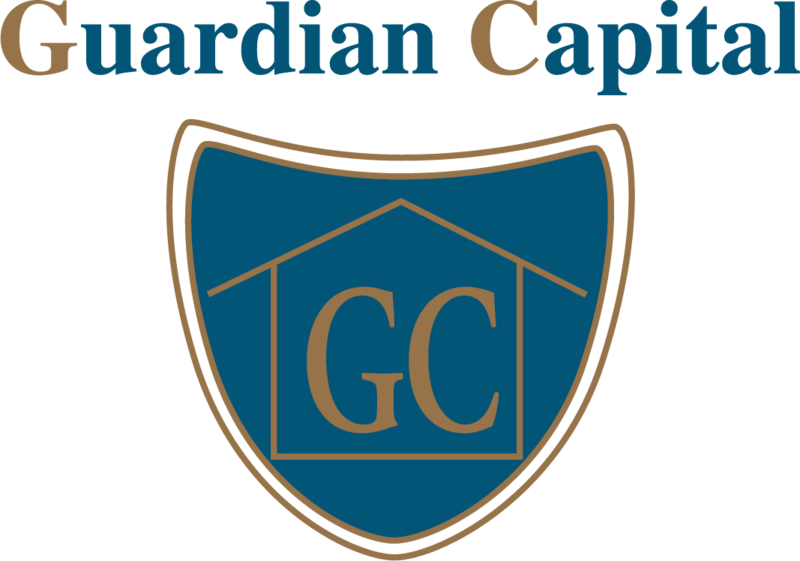 “As we move through the year, our expectation is that we will continue to see some levels of gross margin compression from inflationary input costs,” said Chief Financial Officer Hugh Johnston, on a call with analysts Tuesday. Jim Tierney, chief investment officer for concentrated U.S. growth at money manager AB, has been holding a smaller amount of consumer-staples shares than the benchmark his fund tracks. “If we’re on an increasing inflationary curve, I think that will continue to garner a whole lot of attention from investors,” he said. Still, some economists warn that the Fed could be forced to take the opposite approach, slowing the pace of rate increases, if trade tensions begin to drag down economic growth.